An official ceremony to mark the start of construction of the new Campus Whitehaven took place on site today. The event brought together representatives from the organisations behind the project, main contractor Wates Construction, and most importantly students from the two schools set to be transformed by the campus project. Preparatory works to clear the site have now been completed, including the installation of haul roads, site hoardings and environmental protection measures. Wates commenced main construction works on 8 May with the foundations being laid to make way for the building’s 700-tonne steel frame, which is now under construction. Throughout the project, Wates has pledged to engage local supply chain partners, a commitment that has so far seen the contractor spend £7m with local suppliers and sub-contractors. The new campus is scheduled to open its doors to students in September 2018. Wates worked with parents, students and the wider community on the design and layout of the new schools and sports facilities. The final designs will maximise the educational and broader health and well-being benefits of the new campus approach. The unprecedented £30million investment in the campus comes from a range of partners including The Nuclear Decommissioning Authority, Sellafield Ltd, Copeland Borough Council, Copeland Community Fund, and Cumbria County Council. The campus will include new state of the art facilities for St Benedict’s Catholic High School and Mayfield Special School and bring them together on the current St Benedict’s site replacing the buildings, radically improving the teaching and learning environment and creating the potential for boosting students’ aspiration and attainment. As part of an approach, aimed at improving the whole community’s health and well-being as well as education, the project includes new, community accessible, sports provision on the campus site. Overall the project is about investing in the future of West Cumbria, ensuring that there is the knowledge, skills and good health in the community to get the most from the opportunities presented by the anticipated growth of the nuclear and renewables industry. “This is a hugely significant moment for the area. “Campus Whitehaven will help the community take its future into its own hands by providing an inspirational learning environment for young people, helping them to take advantage of employment opportunities. “It will also be an important asset for the whole community, offering access to top-class sports facilities and lifelong learning with potential to improve the lives of thousands of local people. “By consulting closely with our clients and the wider community, we have developed a comprehensive understanding of their hopes and aspirations, as well as those of parents and students, for the new Campus Whitehaven. We have an excellent team in place and are now well underway with the next step in creating this state-of-the-art centre for learning and sport. "This formal groundbreaking ceremony is the culmination of several years commitment and planning. The governors of the school are delighted to see the realisation of this exciting project. The re-build of St Benedict's school and co-location with our friends and colleagues at Mayfieid school is a clear demonstration of our positive futures." “This event marks a significant step towards the provision of our new schools. We are very excited to see the plans becoming a reality. 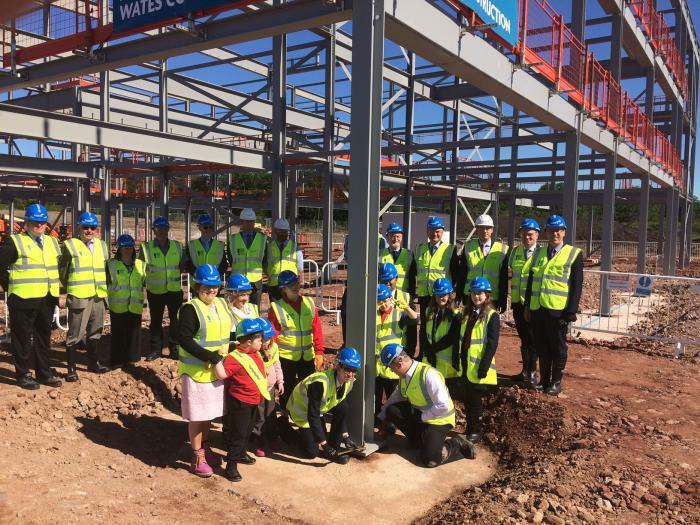 Wates have been proactive in enabling all of our pupils to visit the site. We are looking forward to the new and innovative learning opportunities which will be realised through the Campus project and the positive impact that it will have on the whole Community. “I’m proud to help mark this exciting milestone in a state-of-the-art project that will be transformational for the lives of so many young people in our community for generations to come.